Tonight [14/12/12] marks the national American TV debut of The Beatles’ Magical Mystery Tour, on PBS’ Great Performances. The broadcast will be preceded by a new documentary on the making of the Beatles’ film, Magical Mystery Tour Revisited. Originally broadcast in black and white on BBC One on Britain’s Boxing Day in 1967, the controversial, surreal film was not what the British public was expecting, having become accustomed to the lighter entertainment of the singing group’s A Hard Day’s Night and Help! 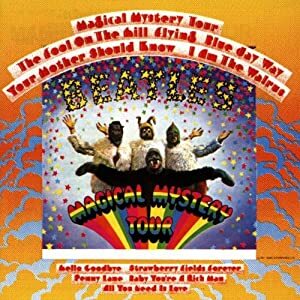 The new film—which featured songs like “Magical Mystery Tour,” “The Fool on the Hill,” “I Am the Walrus,” and “Your Mother Should Know”– followed a Petula Clark special. The Beatles’ film has been available on bootleg DVD most of the time since it was first shown, though it was on VHS in the late 1980’s. The version being broadcast tonight has been fully restored to the highest technical standard with a remixed soundtrack. The documentary on its making features new interviews with Paul McCartney, who came up with the film’s original idea, and with Ringo Starr, who is credited as its director of photography. There are also older interviews with John Lennon and George Harrison. via “The Beatles’ Magical Mystery Tour” To Have National American TV Debut Tonight – Forbes. Badass Beatles Tribute Band Brings ‘Magical Mystery Tour’ to L.A.
15 Dec	This entry was published on December 15, 2012 at 2:17 pm. It’s filed under Article, Video and tagged Beatle, Fool on the Hill, George Harrison, I Am the Walrus, John Lennon, Magical Mystery Tour, Paul McCartney, Ringo Starr. Bookmark the permalink. Follow any comments here with the RSS feed for this post.